This painting depicts designs associated with the site of Lupulnga, a rockhole situated south of the Kintore community. The peewee dreaming is associated with this site, as well as Kungka Kutjarra or the two travelling women dreaming. 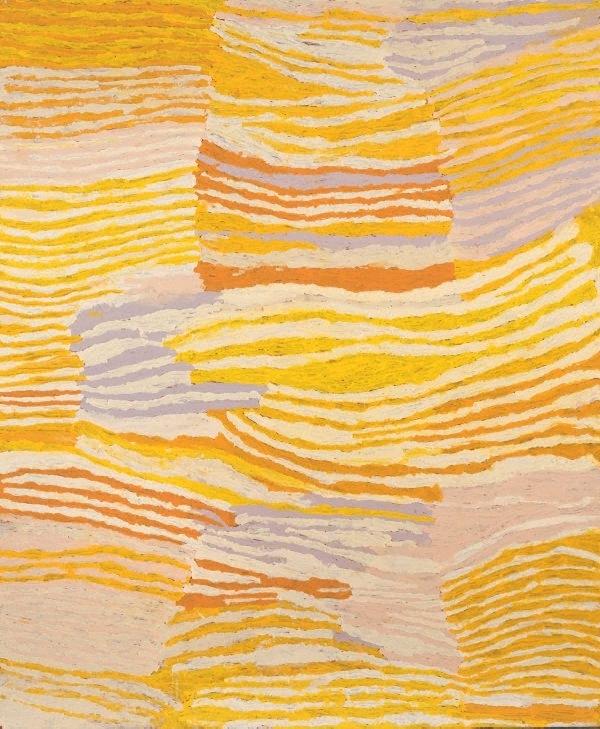 During mythological times a group of ancestral women visited the site holding ceremonies associated with the area, before continuing their travels north to Kaakuratintja (Lake MacDonald), and later the Kintore area. The lines in the paintings represent spun hair-string which is used in the making of nyimparra (hair-belts), which are worn by both men and women during ceremonies. Hetti Perkins, Art + soul: a journey into the world of Aboriginal art , 'Home + away', pg. 1-86, Carlton, 2010, 3 (colour illus. ), 278.